Shelley Hight, co-owner of Happy Jack’s Diner food trailer, makes a shaved-ice sno ball on Monday. The new diner is located in the Harley-Davidson parking lot near the Durango Mall. It’s named after the family dog and serves soups, salads and paninis along with a wide variety of shaved ice (including flavors for dogs). Shelley Hight, holding Jack – the namesake of her new business, and her husband, Freddy, moved to Durango from Missouri in January and quickly began searching for a place to start Happy Jack’s. 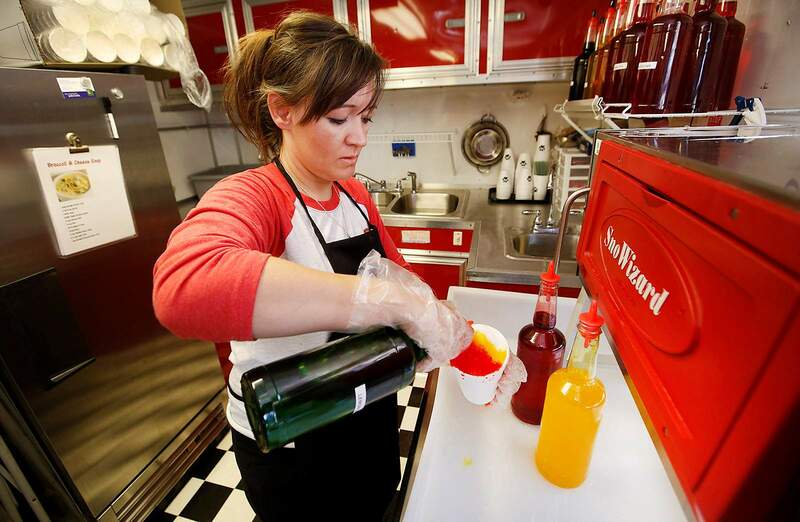 Shelley Hight, co-owner of Happy Jack’s Diner food trailer, makes a sno ball on Monday. Hight decided to serve the summertime treats when she noticed a distinct lack of them in the area. 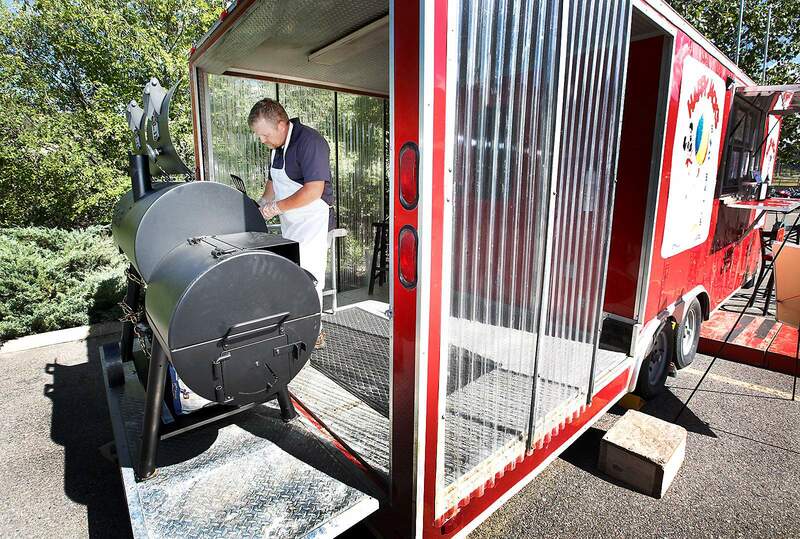 Freddy Hight grills an Angus burger on the back of Happy Jack’s Diner food trailer. Catie Bird of Durango Harley-Davidson said that the food trailer is a good match for the motorcycle dealership. Shelley Hight may just be in the business of making memories. Or, perhaps more accurately, she may be in the business of recreating memories through the power of nostalgia and good ol’ family recipes. The native Oklahoman moved to Durango last January from Missouri. 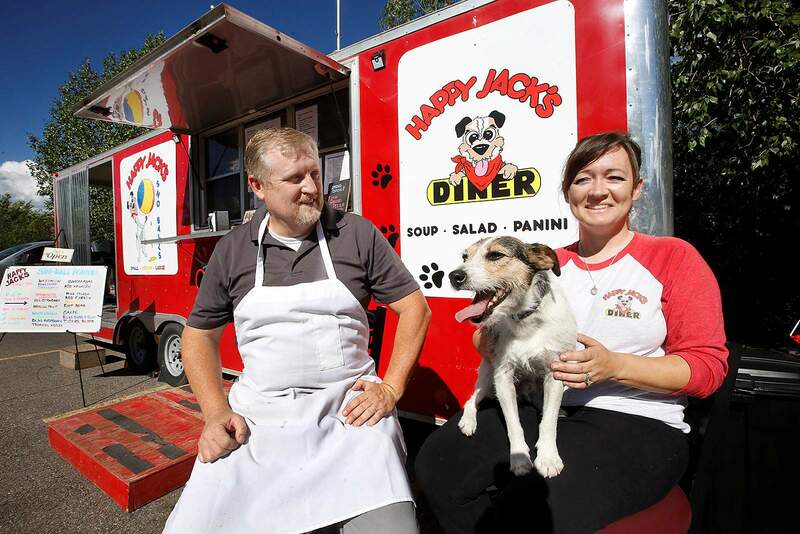 She soon began her search for the food trailer that would become Happy Jack’s Diner, which opened in July in the Harley Davidson parking lot at 750 S. Camino Del Rio. With Happy Jack’s – named after her Jack Russell terrier – Hight continually recreates settings and sensations familiar to her from a background growing up in a big family that had a lot of cookouts. Her grandmother had 10 children, and Hight has four brothers and a sister. Happy Jack’s menu reflects this association with times of togetherness and celebration, if not childhood itself, with its many choices of hot dogs, soups and sandwiches. When the warm weather arrived in Durango, Hight noticed a distinct lack of the familiar summertime favorite in the area. “We come from the South. There are sno-ball stands everywhere,” Hight said. As plans were finalizing for Happy Jack’s, she knew she had to incorporate sno balls into the operation. For Hight, with the summer heat, “snow cones are the perfect way to cool off.” She fondly recalls past summers living in Rolla, Missouri, where she would drive across town with her children to reach the mecca of a little shaved-ice stand. Happy Jack’s offers the traditional sno ball as well as what Hight calls “the avalanche” – a layer of shaved ice and flavoring, a layer of ice cream, and another layer of shaved ice and flavoring topped with whipped cream and a mixture Hight makes from sweetened condensed milk. Teresa Russell of Little Elm, Texas, traveling cross-country on motorcycle with a group of friends headed to Wyoming for the Aug. 21 solar eclipse, had to recently make an unexpected stop at the Durango Harley Davidson because of a bike breakdown. But Russell and her party passed the time sitting on picnic tables in the lot talking and enjoying food from Happy Jack’s. “They had everything we needed while we waited on our bikes,” Russell said, pointing out that Hight let her personalize her salad order. Russell also enjoyed a piña colada-flavored sno ball. “Snow cones are so refreshing when you’ve been out in the heat and want something sweet – just like when you were a kid,” she adds. Creating community through food extends past Hight’s family experiences. She previously worked at a junior high cafeteria where she was in charge of the soup menu, and she also helped lead the food program at a domestic- and sexual-abuse shelter in Rolla. Happy Jack’s continues Hight’s love for creativity and fellowship, and draws upon her skill with resourcefulness. Catie Bird, who co-owns and manages the Durango Harley-Davidson with her husband, Trevor, said Happy Jack’s is a strong match for the business. 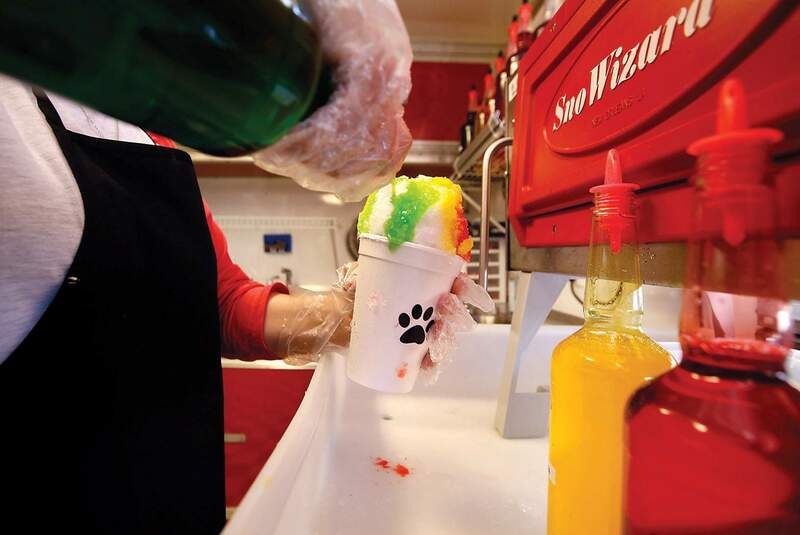 “It’s a great location – it’s good for riders and they can grab a snow cone,” Bird said, noting that her kids love the “tiger’s blood”-flavored avalanche, which is a blend of fruit flavors. Bird also appreciates Hight’s willingness to make special take-home orders of soups. “On Sundays, we pick up a family-sized tub that we can eat throughout the week,” Bird said, praising the chicken and dumplings in particular. The recipe for Hight’s chicken and dumplings comes with its own family lore. While Hight used to make the soup one way, her former mother-in-law made it another, and Hight’s kids liked the way their Nana made it. So Hight learned to make it Nana’s way. The soup was such a favorite of her son Joshua’s that Hight had to teach his wife how to make it Nana’s way when she was visiting the couple in Jacksonville, N.C., where Joshua is stationed with the Marines. The youngest of Hight’s three sons, Joseph, 16, has been helping Hight operate Happy Jack’s since it opened – and he claims chicken and dumplings as one of his favorite menu items. The flexibility and independence of the food-trailer model allow Hight to experiment with and introduce new recipes that reconstruct favorite family memories while also creating new indelible ones for herself and Happy Jack’s customers. Contact Paige Gray at blankpaige@gmail.com. Open Monday–Friday, 11 a.m.–6 p.m.; Saturday, 11 a.m.–5 p.m.